Have you tried all the products on your site? I’ve definitely used a good majority of them. My job as the Beauty Editor is to decide what products we should consider selling for VIOLET GREY. We have a curation standard that we call The Violet Code. In order for any product to make it on the site, it has to be deemed unique and best-in-class by myself and our community of experts. I work with about 50 to 60 celebrity makeup artists, hair stylists, aestheticians, and dermatologists who test all the products and provide feedback on their quality. Depending on their response, I decide what is good enough to make it on VIOLET GREY. Because I’m the Beauty Editor, I’m constantly testing out new products for our site. 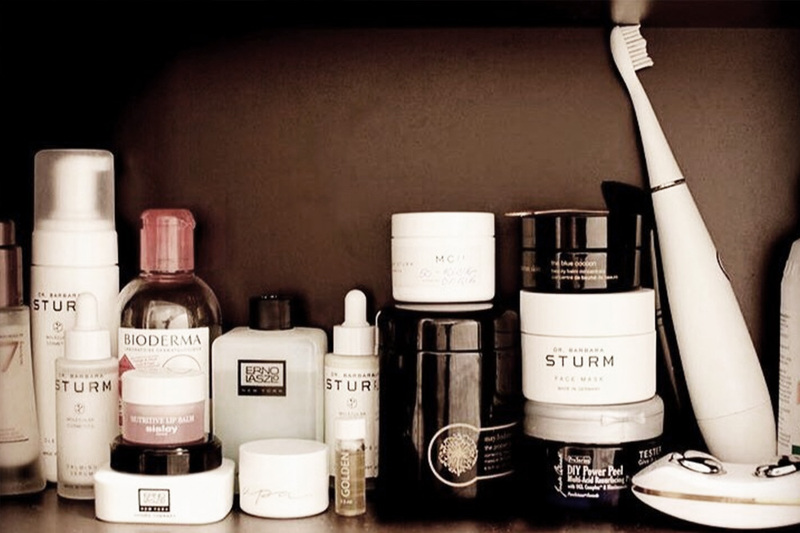 But here’s the rundown of some of the beauty essentials I use consistently. First, I wash my face with Dr. Karyn Grossman’s Replenishing Cleanser. Dr. Grossman is my dermatologist and she’s a genius. She’s also saved my skin on multiple occasions when I’ve tried too many things. Then I’ll use Dr. Sturm’s Hyaluronic Acid Serum, which plumps up my complexion and gives it a glow. On top of that I layer the Tatcha Indigo Face Cream and it makes my skin feel like silk. The indigo is incredibly soothing and actually is proven to help with eczema. My final step in terms of skincare is always sunscreen, which I apply on my face and neck. I can’t live without Elta MD UV Clear SPF 46. It has an amazing texture that goes on seamlessly without leaving any white cast. What are the makeup products you cannot live without? I’m very minimal when it comes to makeup, so I love products that enhance my features in a naturalistic way. Jillian Dempsey Lid Tint in Dew is a perennial favorite. It’s a clear balm that I put on my lids to make my eyes pop. I also love the Serge Lutens Comb Mascara—it really defines and lifts my lashes. I don’t wear any foundation or concealer, but if I want to add a little color I use Glossier Cloud Paint in Dust on the apples of my cheeks. When it comes to my lips, you can usually find me sporting the Dior Lip Glow in Pink. Has been your biggest beauty discover in 2017? At the end of May we launched a women’s shaving range called Mave New York and when I first learned about it I remember thinking the founder, Marisa Newman, is about to change the shaving category. Inspired by Constantin Brâncusi’s Bird in Space sculpture, the sleek off-white razor has an extended handle (6 inches, to be exact) that makes it easy to shave those hard-to-reach places. The razor is made from high-quality long-lasting resin that can stand up to the constant moisture of the shower, and it is compatible with the Gillette Venus Blade. It’s pretty genius. What would be your top five beauty product to recommend to a busy mom who needs a glow but no time in the morning? Dr. Barbara Sturm Sun Drops SPF 50: Don’t let your skin go unprotected no matter how busy you are! This game-changing SPF 50 eliminates the need to layer product and melts into your day cream or right onto bare skin. All you have to do is drop it into your moisturizer or foundation. True Botanicals Hydrating Mist: This mist is the perfect product for an on-the-go mom. You can use it to set your makeup or reinvigorate your skin. Ilia Illuminator in Polka Dots and Moonbeams : Either apply straight from the stick or tap it on your cheekbones, bridge of the nose, and cupid’s bow. It’s the perfect product for that lit-from-within radiance. Chantecaille Longest Lash Mascara: Although this won’t give you a glow, it will contribute to it. A few strokes of this mascara really frames the eyes. It also contains a peptide that helps grow your lashes, so you’re basically multitasking. RMS Un Cover Up: This coconut-oil based concealer comes in a pot so it’s finger friendly and easy to apply. Just tap, tap, tap on the areas you want to conceal. You just launched mom and baby. How did you come up with the idea? Although, I’m not a mother (yet), our clients, advisors, and experts are always on the hunt for the best products to use during their pregnancies and on their children. 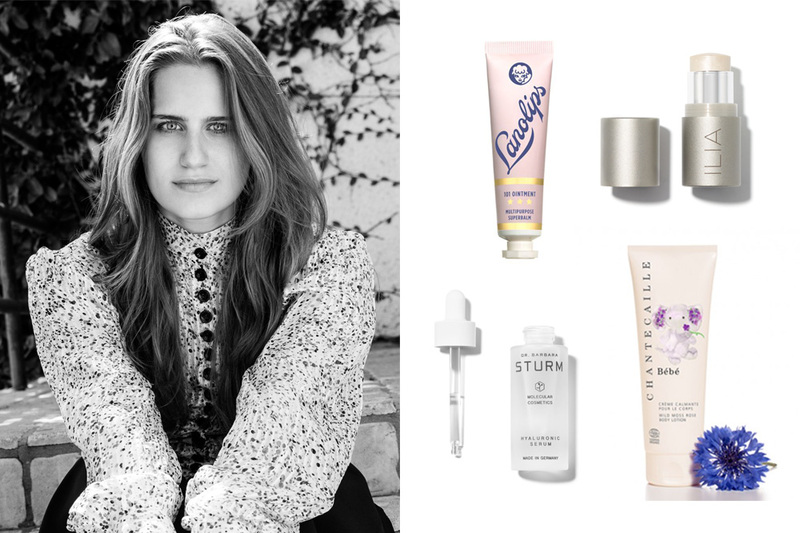 Instead of having a multitude of artists test these products, I worked with about 10 influential women in New York and LA who are either expectant mothers or already have young children. I sent them an array of products to test in order to find out what real moms deem the best-of-the-best. I also sent each of them a survey inquiring about the current products they are using. The range that was the most mentioned was California Baby. We’re bringing on our four favorites from the line and launching them alongside new baby brands that have incredible ingredients. When it came to deciding what to consider for the moms, I really wanted to find products that were not only safe, but unique. In my research it was very hard to find a skin care line that catered to pregnant women. Many of the options had solid formulations, but had substandard packaging or underwhelming sensorial experiences. I ended up having a meeting at the perfect time with True Botanical’s founder Hillary Peterson. She was about to launch a four-piece collection created with pregnant women in mind (think: zero toxins, nourishing ingredients, and 100-percent safe for mom and baby). With that, we’ve also launched new products from Shiffa, Pursoma, and Lanolips that are amazing options for expectant mothers. I often use baby products myself, such as Mustela shower gel or body oil, or baby sunscreen. I like Babo Botanical too! If it's good enough for baby then for sure it's more than good enough for me! What are some of the baby products you recommend for moms, or that you have tried? The Chantecaille Bébé Body Lotion and Body Wash is really luxe. It’s delicately scented and leaves the skin incredibly soft. Also, Mandana Dayani, who was one of our testers, told me she uses the California Baby Calendula Body Lotion on her daughter and on herself. After trying it myself, I understand why—it’s soothing and keeps skin really hydrated. Who are some of your mom role models and why? Even though my mom drives me insane, she truly is one of the hardest working women out there. She always had her own career while raising me and my sister, and I think her extraordinary work ethic has really rubbed off on me. Who is your main Beauty Icon? Then and Now? Then: Julie Christie. As she has aged (she’s 77) her look has changed, but she’s managed to stay natural and youthful. She’s held onto her appearance and I love that about her. Now: Violette, the French-born, New York-based makeup artist is my current beauty icon. I trust her judgement on everything when it comes to beauty. Her taste is impeccable. I think what’s most inspiring to me is her play with color. I’m not one to wear a lot of color on my face, but Violette has a knack for creating bold looks that could be categorized as minimal, even if it is an electric blue cat eye.